At first, “El Zahir” seems like another Borges story about Buenos Aires. There are a lot of specific locations mentioned. The Zahir is a coin that the narrator (who calls himself Borges) receives in a store at the corner of Tacuarí and Chile, which is on the edge of the barrios Monserrat and San Telmo. A few days ago I walked up there and took this photo. It’s not a very good photo but it gives you an idea of the area. Most of the buildings that are there now were there sixty years ago when Borges wrote “El Zahir”. 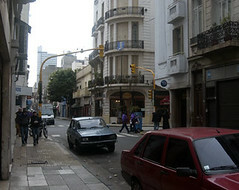 It’s a typical street corner in Buenos Aires. But “El Zahir” is about much more than Buenos Aires. It’s really another one of Borges metaphysical stories where he explores the concept of God. As I was re-reading “El Zahir” I couldn’t help but think that it has some similarities to “The Writing of the God” and that the two would make good stories to read in tandem. After finishing “El Zahir” the other day I turned the page and was surprised to see that “The Writing of the God” is the very next story in the El Aleph collection. You can bet that Borges wanted these two stories to be read together.